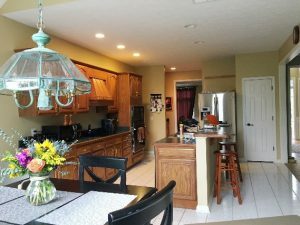 Between the minor structural changes and the major cosmetic updates, this once dark and dated kitchen is now bright, airy, & beautiful. The simplistic cabinet design combined with the dynamic white and gray pinwheel-tiled floors & shimmery Minera Cambria Countertops makes this white shaker kitchen anything but ordinary. 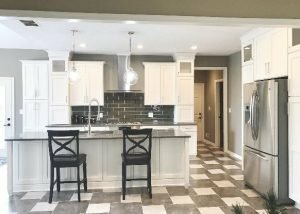 By converting the existing pantry to a cabinet pantry unit, lowering the height on the island bar, relocating the oven and microwave, & increasing the amount of lighting, square footage is visually added to the space. 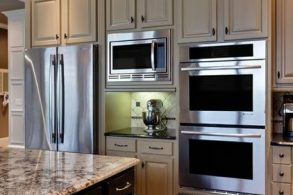 The contrastingly dark 4”x12” glass backsplash tile and the metallic hood against white cabinets create a stunning focal wall. The staggering heights on the cabinetry allow both visual interest and increased storage and emphasize the feeling of a very custom kitchen. The glass wall cabinet doors compliment the glass pendant lights above the island and add yet another interesting visual element to the room. 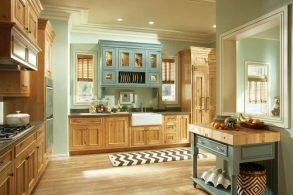 The simple and symmetrical cabinet design pairs nicely with the detailed two-toned floors to keep the space feeling both lively and inviting. The circular decorative lighting fixtures offset the harsh lines of the otherwise rectilinear design. 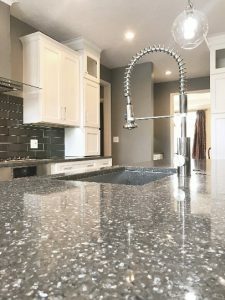 The high-arc commercial-looking faucet and the substantially-sized cabinet hardware add the perfect touch and compliment the metallic flecks found in the quartz countertops. Overall, this Carmel kitchen blends the variety of materials, textures, & patterns perfectly to create a classic and timeless design. 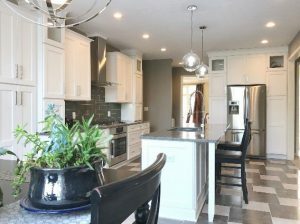 To view more completed kitchens, please visit our https://liveaco.com/projects/glore-kitchen-remodel-photos-carmel/ If you are interested in remodeling your kitchen, please call us today @ 317.575.9540 to set up an appointment with one of our skilled designers.